I've made very little sock progress, mainly due to the fact that I've glued to the computer screen plugging in numbers for taxes. That, and roller derby practice are taking it's toll on my knitting. We're only a couple of weeks away from our bout against the Cincinnati Roller Girls, so practice is major priority right now. We had a speed skating coach come in Monday, which I know helped me like crazy. He showed me a couple of tricks on my form that just boosted my speed right away. It was great! 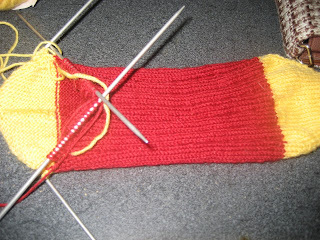 I'm just starting to turn the heel. It's not going to be the prettiest sock in the world, but damnit, I am determined to break my sock curse!